The CMO Survey asked marketing leaders to rank a set of marketing capabilities in terms of importance and to identify their organizations’ biggest gaps in these same marketing capabilities. Details of these analyses are available here. Creating a matrix that crosses capability importance and organizational gap, the Figure shows firms’ digital marketing capabilities (including digital, social, and mobile) as the area with the greatest opportunity for company investment. Build digital marketing capabilities around the customer. Many companies fail because they let technology drive their digital strategies. To succeed, digital marketing capabilities must utilize customer insight, deliver strong customer value, and develop positive customer relationships that create value for the company. Develop digital capabilities not just digital strategies. Capabilities are bundles of marketing skills and knowledge, exercised through organizational processes, enabling a firm to carry out its digital marketing activities. 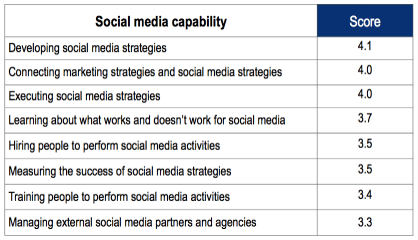 As one example, we developed a set of measures to assess that state of social media capabilities that cut across different aspects of the management of social media. Marketing leaders rated “How well has your company developed strong knowledge and skills in each social media area?” where 1=not at all and 7=excellent. The average capability rating of 3.69 (see Table) is too low to become the basis for competitive advantage. Hire and train digital experts. Many companies are quickly ramping up to hire and train their workforces with digital skills. There remains a human capital gap in many companies that needs to be resolved through aggressive hiring and training. Bolt digital into the fabric of the organization. Leaders need to model a digital mindset that doesn’t just layer digital onto existing strategy, but instead conceives of marketing and the management of customer relationships and brands entirely from a digital- customer interaction mindset. Integrate marketing strategy and digital strategies. Survey data show that companies have not improved on this metric in their integration of social media to marketing strategy over the last five years. When asked “How effectively is social media linked to your firm’s marketing strategy,” companies scored a mean of 3.9 on a 7-point scale where 1=not at all integrated and 7=very integrated. This number was 3.8 in February 2012! Demonstrate the impact of digital spend. Although spending on social media has increased 234% from 3.5% to 11.7% of marketing budgets from 2009-2016, marketers report making little progress on proving social media’s impact on the business with only 20.3% able to prove the impact quantitatively. Drive digital actions against marketing goals. Digital is like any other part of marketing strategy—it should be driven by goals and objectives. Mimicking competitors and using the newest released digital tool just because it is new do not count as marketing objectives! Do not confine digital to its own department. Instead put it in marketing or another key customer-facing group. Digital is a dynamic marketing function and not an IT function. Linking digital to key revenue-producing activities within the firm will also ensure that digital is connected to how the company captures value for its bottom line. Christine Moorman is the T. Austin Finch Professor, Sr. of Business Administration at The Fuqua School of Business, Duke University. Professor Moorman’s research focuses on understanding the nature and effects of information utilization and learning activities by consumers, managers, organizations, and financial markets. She has examined these issues in contexts ranging from innovation, marketing research relationships, networks and interfirm alliances, and the impact of public policy and regulation. Professor Moorman is the author of “Strategy from the Outside In: Profiting from Customer Value” with George S. Day, which was awarded the 2011 Berry Book prize for the best book in the field of marketing. Professor Moorman is the founding and current Director of The CMO Survey. The Marketing Journal will provide periodical updates from Professor Moorman as future surveys are administered.